A BMW containing four males was being followed by officers on Bingley Road before it crashed at the junction with Toller Lane at 05:30 BST. The road was closed and is likely to remain sealed off for most of Thursday. Evidence is being gathered at the scene. The crash has been referred to the Independent Office for Police Conduct (IOPC). 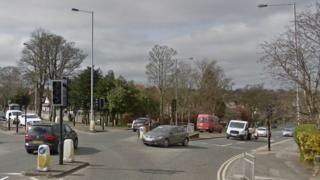 The IOPC confirmed an unmarked West Yorkshire Police car was following the BMW. "This is a most tragic incident and our sympathies are with the family and friends of those who have died. "Our investigators are attending post incident procedures, have travelled to the scene and have begun gathering evidence." She added that an independent investigation was opened at 06:24.